Good morning :) I blogged about the Accessories Kit 2.0 the other day, and here's a mani I did with it. I started with a simple design: I used the triangular shape of the template, picked up the image and lined up one of the sides of the triangle to the side of my nail. 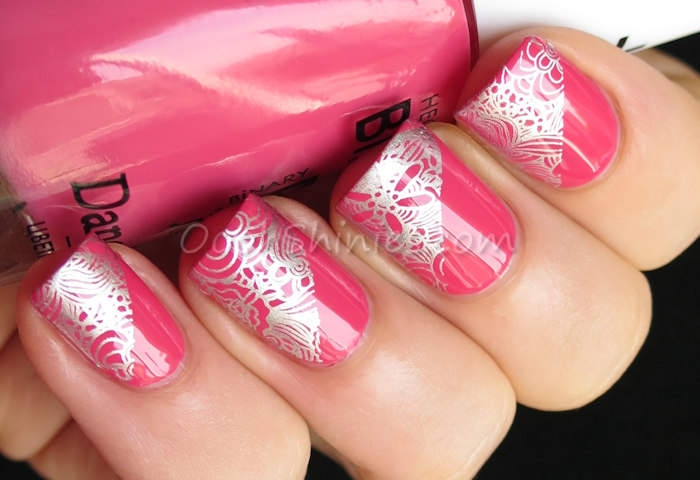 Easypeasy diagonal stamping! ^^ The image that I used is a big one from UberChic Beauty, so I could stamp a different, yet matching design on each nail. You can see the plate in this post. You can win that entire plateset in my UCB giveaway, but don't wait too long with entering, because it'll end later tonight! Dance Legend Julia with China Glaze Millenium, Messy Mansion Accessories Kit 2.0 and UberChic Beauty plate UC-3-02.